How is it the end of the year already?! Anyone else’s mind blown? Since we are gearing up for 2018, we took a look at SLP Now’s most popular posts from 2017. Be sure to read until the end for a special giveaway! This post reviews my very favorite way to organize my materials. I’ve traveled/moved quite a bit over the past few years, and this tote has become my “go to.” I know that I can use this rolling tote no matter where I end up (and I know I won’t break my neck getting materials from classroom to classroom–or from building to building–in the process!). Well, that’s 3 for 3! I do love some good organization posts! I wrote this post after I started using a therapy cart to organize my most-used therapy materials. I parked this guy right next to my therapy table and used it to organize writing utensils, books, student folders, and more! Ah, data! Everyone’s favorite, right? This was written a few years ago, but it was still really popular this year! The post includes a massive review of different data collection options. This is the post for you if you’re struggling with data collection but aren’t sure what to change. I walk through everything from traditional paper data to digital data. Lots of free resources are included in this post, too! 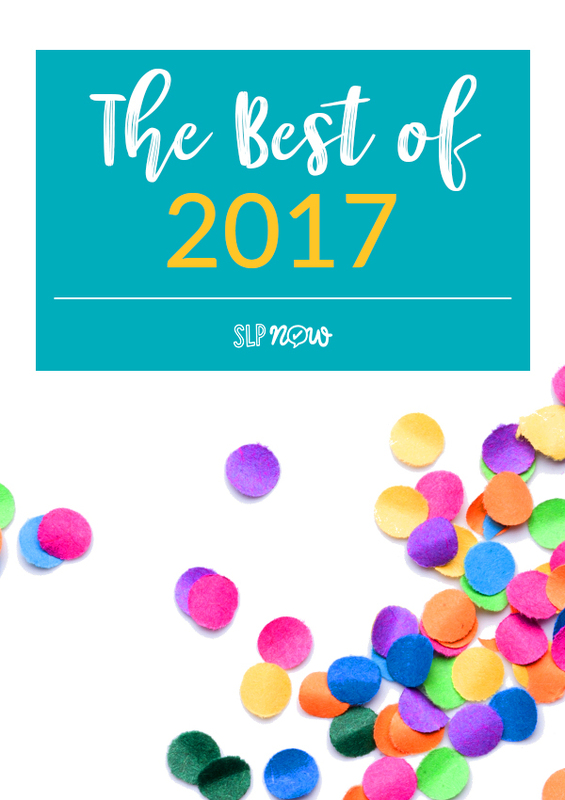 The most visited post of the year… The SLP Now Themed Book Lists! If you’re looking to get started with literacy-based therapy, this is a great starting point! It includes lists of my favorite books (organized by theme/season). Because this is our 100th post, we are having a GIVEAWAY…! I love the book list and the idea to get a rolling therapy cart. As a SLP-CF who travels to multiple schools in my district, I feel like it is so important to stay organized and ready to go. Book themed lessons cut down a lot of planning time too! I love all of your organizational tips and your no nonsense approach to therapy!! Winning this contest would be a great way to start out 2018 being organized and ready to go! The materials and supplies would be awesome to have to help support the need of my wonderful students! Thanks for the opportunity! Definitely refer to the book list often! 7 tools to organize speech therapy materials! Between two schools, every bit of organization helps! I found the themed book list very helpful. Thank you for hosting this giveaway! What an amazing giveaway! I would love to win. I watched your Curriculum Based Therapy course during the Summer SLP Summit and it was so helpful! That’s so good to hear! Thanks, Elizabeth! This is such a great giveaway! A rolling tote would be great for the traveling SLP! youve done something so incredible here Marisha and I know you’ve helped so many SLPs out there. Thank you for everything you do for us. If 2017 was this great, I can’t wait to see what’s to come in the new year! Thank you, Katie! Definitely excited for 2018! I am really excited about your literature-based therapy post! My goal for 2018 is to use children’s books to target goals with my entire caseload, so I was THRILLED to see this post! Thank you!! This is so great. Thanks for all that you’re constantly doing! I absolutely appreciated your themed booklist blog post! Thank you for everything you do for SLPs! The book list is great since I work with all PK kids! I made a goal for myself to use all the books I own in therapy rather than letting them sit on the shelf. Happy New Year! Thanks Marisha for the awesome giveaway! Hope you had a very happy Holidays! I love absolutely everything about your site! It has been a life saver for me this year! My goal for the 2017 school year was to incorporate books into therapy and you have helped me tremendously with this, it is so organized and helpful! Thank you so much for everything! 😊 I can’t wait to continue with you in 2018! The book list is a favorite for me – I love your materials and have been eyeing up a membership!! This would be a fantastic win!! I seem to be like the majority, but I love the book list! Such a helpful post! To win this would be an amazing way to start 2018!! I use the seasonal holiday book list probably monthly! It’s a great way for me to organize for the month. I have been more diligent about checking it a few weeks ahead of when I actually need it so I have enough time to get it from my library. I love finding new books on your list that I have never read! I too love the seasonal book list! It’s been a time saver for sure!!!! I love all of your organization tips! I especially appreciate your efforts to streamline materials and stop me from recreating the wheel. This is so incredible! Your organizational skills are incredible and your materials are well-worth the subscription fee! SLP Now is an invaluable resource! Always enjoy your posts and products! Thanks for all you have done. You are an inspiration. Your materials and new data collection addition to the membership are so great! Thanks! Thank you for the give away. The book list will certainly be a great reference. I’ve heard many wonderful things about your program. Would love to try it out! Your themed book lists have been super helpful and my favorite post! My favorite posts are the 7 Tools for Organizing Therapy Materials and the Themed Book Lists. It’s so easy to get surrounded by a ton of materials in piles! Both posts gave me suggestions that I could immediately implement to make my day and my therapy sessions run smoothly. And my students love the books! Thank you for sharing so much awesome information!! I am a member & love SLP Now resources! I want to use more books in therapy, so your themed book list will be very helpful. Thank you! Why, this one is my favorite, of course! Actually, everything I receive is so practical and, yet, fun! Thank you! I’ve always thought about getting a rolling tote, but have never known how I would organize it. I love this idea, especially because of the emphasis on literacy-based therapy! Thank you for taking the time and effort to maintain a blog and share your ideas with the SLP community. And for this wonderful giveaway too!! I found the Data Collection Solutions post very helpful! That’s one area that I struggle with quite a bit, and your insight was very useful! I’m anticipating a job change for next school year and I love all the organizational ideas. Hard to change a current office but lots of ideas for my new one. I like the themed book lists and the ideas for organization. Would love to win a kit! Thanks for the opportunity!! Starting back to work In January and this would be the perfect gift! Your book list is a life saver. Thank you so much! I really liked the post about organizing your library. I’m just about to try the Book Buddy app! Thanks for all the great tips! Thanks. Love all the ideas. I love all your organization tips! I always get compliments when I use something from you. I love ❤️ the book units with lists of articulation words and extra activities! I have been using your products all school year. Planning has never been easier. I love your videos and organizing blog posts. I just recently signed up for the SLP now and I am loving the materials. It is so easy to prep now. I have used books before in therapy but I am excited about the organization of this site and how it incorporates books into therapy. My January is planned already thanks to you. I would love to win the giveaway for even more support! I love the rolling cart idea. I have been looking for ways to get and stay organized! These look like great organization tools to start 2018 off right! The book list is my favorite resource! I love your blogs/videos about organizing speech therapy materials. Always looking to improve. Lots of great ideas that I can share with my graduate students! I love following you on all the platforms!! love, love, love your products! I refer to blog for the variety of tips and ideas you share! I’ve watched your videos/ceu’s and always appreciate your information. I so appreciate your goi g above and beyond with the help and support you offer to SLP’s :). This giveaway is fantastic and it would be a dream to win and go back after break with that tote!! This is an awesome givaway!!! I Love so many of you blog posts. You have many neat ideas, especially with organization. Thanks for sharing you ideas and for this give away! I’m a fan of the multi-posts of Speech Bubble (S.M.A.R.T. Goals, especially), Nicole Allison’s (Teaching Compound Sentences), and Speech Sprouts. They share detailed, step-by-step visuals and instructions for implementation and are like mini C.E.U.s. I get the most out of Marisha’s videos on FB, and I too found the Data Collection post useful, along with most every other post! How generous! I love my SLP Now membership! Such an awesome giveaway! Keeping my fingers crossed! I’m such an organizing junkie…I always love seeing how other SLPs keep materials ready to go! Love all of your ideas! I’m looking to do the rolling cart soon. Waiting for a sale! You offer such an amazing resource for busy SLPs. I love all your posts, but especially the ways to use books for multiple therapy targets. Thank you for all you do! I have to get organized this year! I will be looking over these past posts to help me! My favorite blog post has definitely been the theme book list post! I refer to the post often, and it has really helped me incorporate more literacy components into my sessions! 7 Tools to Organize!! I have purchased the little boxes set from Michaels (also on sale) and the colored drawer organizer. I love both! I also purchased a HP instant ink printer about a year ago after reading a blog post about it and it’s the BEST thing I’ve done! Thanks for all the great ideas! I love the idea of the materials cart and theme boxes!! Thank you for all the work you have done with SLP Now!!! I’m excited about this giveaway! Thanks for all of your awesome ideas! Congratulations on your 100th blog post! I love following you across platforms, you have so many wonderful ideas and you have provided a really fabulous service for our SLP community! All the best to you in 2018! Would love to win this giveaway! I am constantly looking for ways to get more organized-I try new ways all of the time and haven’t found the best yet-but I keep trying! Thanks for all that you do! Thank you for all the work you’ve done to put this together! I especially love the book list you’ve created. I’m in the process of saving up the curriculum and materials money that our district provides us so I can splurge on an SLP Now membership. I have a therapy cart that has turned into a hot mess! I should probably make a new years resolution to change this! This book list has been so helpful this year! I absolutely love it and it has made incorporating more books into therapy so much easier and more fun! I love your materials! It would be great to win an organized and prepared set of them especially since that is my goal this new year!! I love the book list. Who have so many wonderful resources! I would love to get this organized! Congrats on your 100th blog post, what an accomplishment! I love your resources on TPT and your organization ideas are always fantastic. Thanks for being awesome! It’s amazing all the resources you provide! Thanks so much! I am already an SLP Now member but I would love to have this organized bag in my SLP life! I work at two schools within my district and this would be perfect for me! Loved the themed book list!!! You always give the best information! I need organization! I’ve taken many if your great ideas and need more! 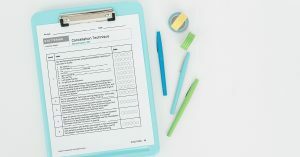 Easy Language Sample Tool for SLPs, it helped when I was completing multiple evaluations at the same time. This post has many great ideas for starting the new year back at school. And winning would help my resolution to be more organized and work “smarter”! Lots of ideas for organization! I need to go read about organizing blogs. I love the organizational posts! I may have the books and printed my materials, but organization is huge for keeping track of everything and great for efficient therapy!! Thank you! Thank you so much for this opportunity Marissa!! You have such great ideas. Thanks for sharing. Thanks for the chance to win your awesome therapy tote and an SLP Now membership!! You have some amazing ideas to make our busy lives easier! I love that you take the time to share your thoughts, ideas, and creations with all of us!!!! This is a GREAT giveaway! Thanks for all of your tips and ideas! This would be a great way to start 2018! Happy New Year! Thanks for the tips and giveaway. Loved the data collection post. Always looking to streamline data collection in a smarter, more efficient, way! What a great round-up! I always love your tips and tricks. Loved the themed book lists! I agree Jennifer, data collection is a sore spot of mine and the data collection post gave me some insight on how to make it easier. I travel to a different school every day (and sometimes back and forth). My biggest ache is that I have everything in a carrying bag. I definitely need to invest in more digital materials and/or a roller bag! Thank you for this wonderfully thoughtful opportunity. I love your therapy cart! A coworker mentioned getting a cart to organize her small workspace more efficiently and so I went searching for one since my space is also on the small side. I stumbled across your blog and became an SLP Now member that same day! That blog is easily my favorite because it turned me on to this amazing resource and website. Thank you, Marisha! My two favorite type of posts have to do with organization and themed books and activities. These have been very helpful. What a wonderful giveaway! Thank you for all the great reaources and ideas! Love the membership! Would be thrilled to win this! Thanks Marisha! I love all of these ideas! Getting more organized is my goal for 2018! I need all the organizational support I can get. This post offered many helpful hints. The post on data collection has been so useful to me as a CF. I’m still figuring out what works best for my caseload, so I love all the options you gave in your post. Thank you! How exciting! What a great and useful giveaway prize. THANK YOU!! Happy 2018! This would really help me with prepping to work with the students in my caseload. Your materials look awesome!!! My favorite post is definitely the one on organization! love seeing SLPs sharing their knowledge. We are better together! Love that organizational tote idea! I travel and it can be exhausting constantly packing up and forgetting things! I’ve been going to the library 1x/month to get the books on your list. I have enjoyed the books and discussions that have been had with some of my groups. Thank-you for sharing! I’ve also tried to incorporate them into my ‘core word’ lessons too. Happy New Year! Thank you for sharing your creativity with others in this profession. It’s so easy to become overwhelmed and lose sight of the big picture. I appreciate your calm approach to working smarter not harder and have incorporated many of you’re planning tools and data collection resources into my everyday practice. Just recently, I am loving the language sample template! Thank you and Happy New Year!! I love the therapy on the go post! As a traveling therapist that post gave me so many ideas. I love your themed book list and all the great organizational ideas! My favorite post is How to Use Evidence to Become a Better SLP! I have always wanted a subscription to SLP Now! I love all of your posts and specific emails about organization for all areas of our speech lives! It was my goal this school year to save materials and organize them! I love literacy based therapy. Using books in therapy is my favorite thing to do. I loved your post about organizing therapy materials on the go! I enjoyed your post on the using the iPad like a pro. It was very informative. I use my iPad a lot with my clients. #5- Organizing Materials I’m always looking for ways to store my TPT materials! 7 Tools for organizing. After several years working in a different setting I have returned to working in a school. My new position came with 30 years of materials from the retiring SLP. I needed some ideas on how to organize and keep track of all of the materials! Thanks for a chance at this great giveaway! I really enjoyed your Organizing Speech Therapy Materials On the Go post. I bought the organizational tote this year as I travel between 3 schools and it has been a lifesaver! Best rolling tote I’ve used by far. Thanks for the tip! Love all your posts! And enjoy learning from you! I love all the time saving ideas on SLP now! My goal for the new year is to invest some time up front into systems that will save headaches and time down the line.. organizing, lesson planning, and starting/reviewing routines with my students! I love the themed book lists. I can go and grab a book with materials ready made. Makes planning for a big caseload easy peasy! This would be so wonderful. All your blog posts are great, but I especially liked 3 Tips for Easy Data Collection. Thank you so much for the giveaway! I love your blog. I like the post about how to organize therapy materials for on-the-go! Organizing speech materials on the go – I got the rolling bag for Christmas! I can’t wait to get it all set up! I like any ideas about how to get better organized. I also like the booklists. I have tons of books but I’m always on the lookout for new ones. It’s so awesome that there are people willing to share their resources and tricks of the trade. When I went into this field, I didn’t know I would have to create or customize materials. I’m not crafty and don’t enjoy making stuff so I’m very thankful for those of you out there who are making new things and sharing them. I referred back to “Organizing Speech Therapy Materials On the Go” a number of times this school year! My top posts are How to Use a Pocket Chart for Literacy-based Therapy and Top 5 Sites for Free Nonfiction Reading Passages! This would be amazing to win! Especially having a book list. I love incorporating books into therapy, having this list would make it so easy and accessible! I love all the great organization tips! The rolling cart is an especially great idea. I also love the themed book list. The booklist along with the cheat sheet idea I learned from the slpsummit last January have changed my lesson planning to the best yet–and I’ve been a school SLP for 17 years. SLP Now is a terrific resource and I can’t wait for this next year and your example videos! I definitely need this organization in my life!! I was introduced to you on the first SLP Summit and I’m so grateful!! I have learned so much. After 20 years, I needed fresh ideas and have implemented many new things from you and many others that I discovered during the summit. Thank you for rejuvenating this “old” SLP!! Hey this looks awesome!!! Fingers crossed!!! This giveaway would be amazing to win!! Your themed book list post is one I use all the time! Thank you! What a wonderful giveaway! Thank you for all you do in sharing your SLP therapy materials! Love your blog posts! I love your site! It makes my crazy heavy caseload easier to manage! I really enjoy your ready to use materials! Happy holidays! Thank you for all these awesome ideas. As a newbie they are fantastic. I love your products and I hope I can win this tote to help me be ready to conquer the new year. It’s my 3rd year as a school SLP and I frequently visit your blog for tips. Thanks! I would love this organization tool as my goal for 2018 is to be more organized! I am an itinerant SLP with no office so I need portable materials! Thank you! Thank you for all of the time and energy you put in toward helping fellow SLP’s be successful in the field! That’s such a generous giveaway! I am always researching organization in attempt to be better organized for me and my speech assistant! I have absolutely loved using the ultimate SLP planner working as a school based SLP, it has been a total lifesaver! Winning this contest world be the greatest kickoff to 2018 as I switch from the public school setting to the clinic setting! I am feeling all the butterflies and this toolkit would make me feel so confident and prepared as I begin this next chapter! Thank you for all that you do for us SLPs out there and happy new year!! My favorite post was the video on how to organize all of the storage boxes with materials! I’ve only been an SLP for 2 years so that post was a huge help! This is awesome!!! Organization inspiration! I love the rolling therapy cart. I need one in my 2 school life! This rolling cart is such a great idea! My daughter is finishing up grad school and she is constantly carrying around multiple bags! I need major organization help!! This looks amazing! I like your book lists, but your blog and all the information you provide is invaluable! It’s difficult to pick one favorite, but if I had to choose it would be the themed book lists. Thanks for all you do! This looks awesome I hope I win. Thank you for your fantastic organizational ideas. I’m such a type B in a type A profession so it’s all incredibly helpful. I am so excited for this giveaway! This would be an absolute lifesaver. I love all your organization posts – all the materials in the world are no help if can’t you find it when you need it! I want this! The SLPs in my district were just given directives to pick up students at other schools if they weren’t at cap and lucky me! I get to be at polar ends of the district and have my elementary case load at one end plus high schoolers at the other end..big change! I love your ideas and organizational strategies!! Thank you! I love the rolling therapy cart for organization and the links to the tpt store! I even made a purchase this week while in break and I can’t wait to get back to work and use them!! I love all of your great tips and the video you presented at the summit, which helped to understand how to connect curriculum to therapy activities . From organization to resources as an SLP grad student your website is so helpful! I love your posts! I marvel at your ability to integrate everything….thanks for sharing it all with us – and for the chance to win some great prizes! I would really love to get the new year off to a great start by winning these great materials. Thank you for having the giveaway! A friend sent me a link to your post. I can’t wait to go see your blog. What great materials for organizing!! What a generous and fantastic (not to mention, functional) giveaway! A School based SLP’s dream! Happy New Year to one the most creative, organized and thoughtful SLPs around! Thanks for hosting this giveaway! The book list is a great resource! I have enjoyed all aspects of your site but have really utilized the literacy based posts and themed books. I am mentoring a new graduate and plan on introducing her to your site as well. I might need to get one of those rolling carts! I know they have them at Michael’s too! I’m only in one building, but I’m fairly certain I will be doing a lot of push in next year. Happy New Year, Marisha! Awesome giveaway! Love all the ideas! This was a great post to catch up on the Best of 2017. My resolution for 2018 is to find and follow an organizational system that works for me and this is a great post to help get me on my way! Thank you for that!! I found Top 5 Sites for FREE Nonfiction Reading Passages to be really helpful. I am always looking for interesting and relevant non-fiction texts for my students. I travel between 3 schools and only have a small former principal’s office in one school, which I was unceremoniously moved into from a full-sized classroom at the last minute… this girl NEEDS some organization in her life! Bad!!!! Amazing give away!!! Thanks for all you do for our profession. My favorite post is the one with tips for getting organized! My goal for the new year is to put some of those ideas into practice. The themed book lists have been very helpful! Wow. Love the simplicity of this set up. I love your book list as well. How have I not seen these resources before?!?! Can’t wait to hunt around! Happiest New Year! I am planning on officially getting a membership after the Summit! Such great ideas and materials! Thank you for your generous spirit and willingness to share your materials and knowledge. Just ordered my library books for January off of your list. Thank you! I have been looking for a bag like this. And the organization ideas are great! Your website has helped more than I ever thought possible for the beginning of my CF year as a school-based SLP. Not even having access to printers during my day, printing your materials out the night before, throwing them in a binder and going on my way has helped in prep time so much! I can’t wait to see what 2018 has to offer! Thanks a bunch! Love the graphs when you put in your data. What an awesome giveaway! I sound like a broken record, but the seasonal book lists are so nice! Obviously, you are a lifesaver to many SLPs! I got to preview the content from the 2017 SLP Summit and loved the lesson plans and materials for The Mitten. Super easy to prep. I have been using the Following Directions assessment so much this year, I am sure the other assessments will be Kitts as useful. How awesome! Thank you for all your hard work and dedication! I am looking forward to the summit! Great organizational tools to use with new year but love all of your ideas. As a second year SLP… I feel as though I realize more and more that I need to look for more resources and knowledge to continue to grow. I have also realized that experience will bring some of this as well and with only 1.5 years as an SLP, I still have tons of time! I would love to have the resources from an SLP! I love the book lists! You have the BEST giveaways EVER. Thank you for all you do to make the field fun! I struggle with themed books so I loved all the ideas. I can’t believe how much thought you put into making our lives and professions more enjoyable! I love your totes, pull-alongs and passion for organization. This looks so good! I saw it on Black Friday too! Would love to see what it looks like! I was just told I had to move my office one week before Christmas!! Looking for an efficient way to organize and get going asap. Yikes! Thank you for hosting this give away. I appreciate all that you are doing. Love all of your ideas on Pinterest! ❤️ And I have time to read them today!!! I can’t begin to tell you how I appreciate you providing this resource and your fast responses to my questions. What an amazing resource you and your site are. Love the organization and graphing for data! I love the post about organizing speech therapy materials on the go! I love the book list. I’m always looking for new books to use with students. Such a treasure trove of ideas and resources! Thank you for sharing! What a great community to be part of! I love being an SLP and love connecting my therapy to books! I love your thoughtful posts, and your ORGANIZATION! You make it look easy!! This is so awesome! I love all of your tips. I appreciate the book lists you created! That’s what got me hooked originally as well as the videos! I need to be more organized. First year CFY and trying to learn the tricks of the trade. Can’t wait to get this giveaway, and start the year off right (and organized)! I would LOVE to win this! I am starting a brand new position in a week. This would be an amazing way to start. So much love for your themed book lists and all of your organizational ideas! Love all the organization tips!! I like your post regarding using books in therapy. What a great giveaway!! I would LOVE to win! !